Hong Kong has been on my travel bucket list ever since I realized how close to nature this city of skyscrapers was. That dichotomy peaked my interest, so when a Scott’s Cheap Flights direct trip from San Francisco to Hong Kong became available, I jumped at the opportunity to go for a few days. I also felt comfortable booking a trip by myself to Hong Kong because of the predominance of English spoken. It turns out, Hong Kong was incredibly safe to travel as a solo, Western female traveler. It was also super easy, as Hong Kong’s transportation system is clean, organized, and efficient. Hong Kong is about as expensive as most major cities in the United States, so don’t be surprised by having sticker shock when you arrive! Nearly everywhere is accessible by the MTR public transit system. Buy a tourist unlimited card or ‘Octopus’ card in the airport when you arrive. I paid about $44 USD for 3 days of unlimited travel plus roundtrip airport transfer. Of note, you have to pay for the card itself in Hong Kong Dollars, so make sure you take out some local currency before you land or at an ATM in the baggage claim area. The tourist desk where the tickets are sold is right to the left after you exit baggage claim. When traveling in Asia, I often find accommodation through booking.com. I have found it to be pretty reliable. In Hong Kong, I stayed in a simple, small, but clean hotel right in the heart of the Jordan Road neighborhood of Kowloon. I really wanted to be in the heart of the action, and I was! I think a lot of western tourists probably stay on Hong Kong Island or the major hotel chains close to the water in Kowloon. 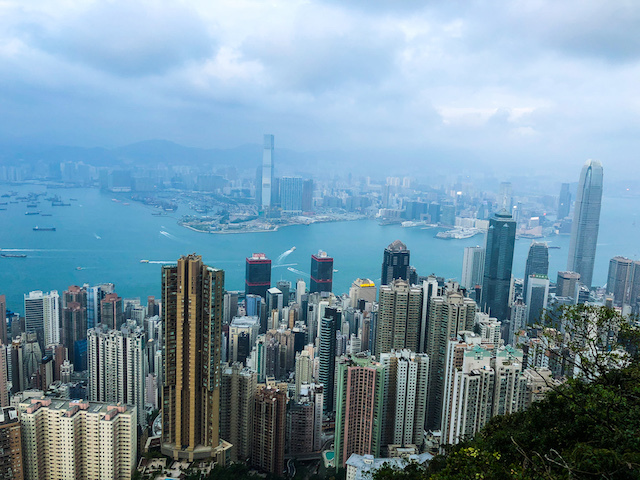 You can’t really go wrong either way, but I enjoyed feeling a part of the hustle and bustle of Kowloon which seemed a little more Chinese than the financial district and ex-pat heavy Central district on Hong Kong Island. I took a very short trip to Hong Kong, flying out on a Wednesday from California and returning the following Monday. I had 3 full days of sight-seeing plus an extra evening when I first arrived and a short morning before I flew back out. The below itinerary is pretty aggressive - I like to pack things in and run around a city until I’m dizzy, so if you prefer a more laid-back approach, considering tacking on an extra 1-2 days to your trip. In general though, I found the amount of time I was there to be nearly perfect. I started the morning walking down Nathan Road, taking in the city in the early morning before most shops were open. I popped into a bakery and picked up what the girl in front of me was ordering, which was a garlic toast and a sugary bun. I noshed while walking down the boulevard, sneaking into Kowloon park past the morning swimmers in the enormous pool and the birds in the aviary. I walked all the way down to the Star Promenade, which though the Avenue of Stars is technically closed for renovation, offered some magnificent views of the Hong Kong Island skyline across Victoria Harbor. Victoria Harbor from Star Promenade. Mid-Level Escalators - a clever way the people of Hong Kong have figured out how to traverse an otherwise steep area of the city with outdoor escalators built into the mountainside. I took the escalators pretty much as far as I could and walked through the Hong Kong Zoo, which was free. It was almost lunch time so I popped into Pure Veggie House for some delectable dim sum. Dim Sum at Pure Veggie House. After getting my energy back, I wandered down to Hong Kong park, which had a beautiful vista point, ponds, and even a tea museum. It was interesting seeing the city workers lazing about in the park during their lunch hour. I meandered south from Hong Kong park to Wan Chai, where I caught a glimpse of the Chung Wui mansion and tried Kam’s famous Michelin star roast goose. I don’t really eat meat, and goose is quite fatty, so suffice it to say I didn’t love it. But, when in Rome! Pro tip: order take-away and eat it on the street to avoid the major line out the door. Stopping by the famous Blue House on Stone Nullah Lane (close to the Wan Chai MTR), as well as the Yick Cheong building (close to Quarry Bay MTR), I grabbed a taxi up to Victoria Peak. 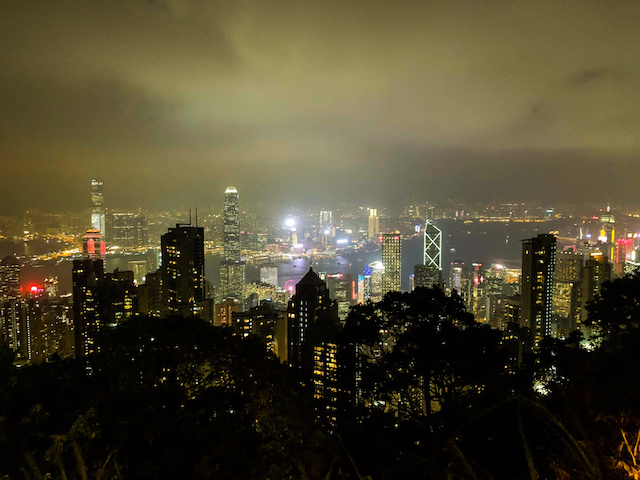 The internet had advised to visit the peak right before sunset, to allow time to hike around and see the city both in the daytime and in the nighttime. This was definitely a good recommendation. Yick Cheong building, otherwise known as “Monster Building”. Once on the peak, I followed the Morning Trail which was a short 2.8km loop along Lugard Road. I felt safe hiking this by myself and even as dusk was approaching, as there were many people on the trail. This trail offers you vistas of the southwest side of Hong Kong Island, and the entirety of Victoria Harbor as you follow it. The trail picks up close to where the funicular line ends. I recommend starting the hike counter-clockwise, so that by the time you finish it is almost night time with the city lighting up below you! After a bit of a struggle to get back into downtown (lines for taxis, buses, and the funicular get incredibly long after sunset as that is when most tourists head home), I ended the night with dinner at Ebeneezer’s Kebabs and a drink at the Iron Fairies, which had to be the most atmospheric bar that leaned into a theme that I have ever been to. The bar is covered in small iron fairies and butterflies suspended from thin twine. I woke up with hopes of visiting the famous Nathan Congee near my hotel. Unfortunately, I didn’t realize Congee, a traditional Hong Kong breakfast item, is normally eaten with meat, and I just didn't have an appetite for it at eight in the morning. I decided to just start on my adventure for the day and hopped on the MTR at Jordan Road. Kowloon is full of fun photography spots due to it’s interesting architecture, so I visited Choi Hung Estate and Ping Shek Estate (at Choi Hung MTR station), and Lok Wah South Estate (at Ngau Tau Kok MTR station). From left to right, top to bottom: Choi Hung Station, Choi Hung Estate, Ping Shek Estate, Lok Wah South Estate (Car Park). After exhausting myself by hunting down cool buildings for photography purposes, I headed back towards Nan Lian Garden, which is off of the Diamond Hill MTR stop. Walking into Nan Lian was like taking a full escape from the city. After staring up at the tightly organized apartments of Kowloon, filled with millions of people, it was a reprieve to duck into a peaceful garden setting with koi ponds. Across the way from the gardens is the Chi Lin nunnery. Inside, there are a number of temple rooms. By now starving, I headed back into the Nan Lian garden and grabbed lunch at Chi Lin Vegetarian for, you guessed it, more dumplings! Dumplings at Chi Lin Vegetarian. After a refuel of food and tea, I headed back down towards where I started my morning and got off at Mong Kok MTR stop. Famous for many shopping streets, each devoted to a single kind of item, I meandered down through the goldfish market, flower market, and Yuen Po bird garden (a bit of a misnomer - it’s a place to buy birds and animals that birds eat). In an effort to sneak in as much of the recommended Hong Kong food and Michelin star restaurants as possible in a short trip, I headed over to Din Tai Fung for, you guessed it, more dumplings! I then took a quick detour over to Tim Ho Wan (supposedly the cheapest Michelin star restaurant in the world), though was a bit underwhelmed given most of the items on the menu were not super veggie friendly. I ended the night at the Temple Street market next to my hotel (Jordan Road MTR station). Day 3 in Hong Kong started at the delectable Australia Dairy Company, which despite it’s name is a Chinese establishment. As a classic Hong Kong restaurant, you are seated at a table with other strangers. 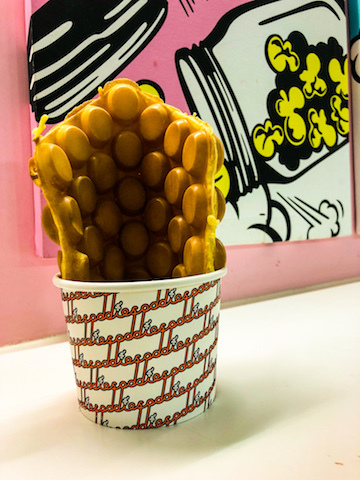 You order quickly from their menu of milk tea, egg, and toast sandwich combinations, and they bring the food out quickly, expecting you to eat quickly. It was delicious and efficient, which was perfect as I had a long day ahead of me in Lantau. Breakfast of champions at Australia Dairy Company. I hopped on the MTR at Jordan Road and took it all the way to the end of the line at Tung Chung MTR station, where I picked up Ngong Ping Cable Car. The ride, though touristy, is an efficient way to get to the Tian Tan Buddha and the village of Ngong Ping. I unfortunately bought a roundtrip ticket before realizing I didn’t have to, so don’t make that mistake if you are planning to explore Tai O or grab a bus back to Hong Kong after. Riding the cable car, high above the mountains! Tian Tan Buddha in the background from the cable car. I was up early and arrived at Ngong Ping on one of the first cable cars. This was ideal since by the time I left, the town was swarming with tourists and tour buses. 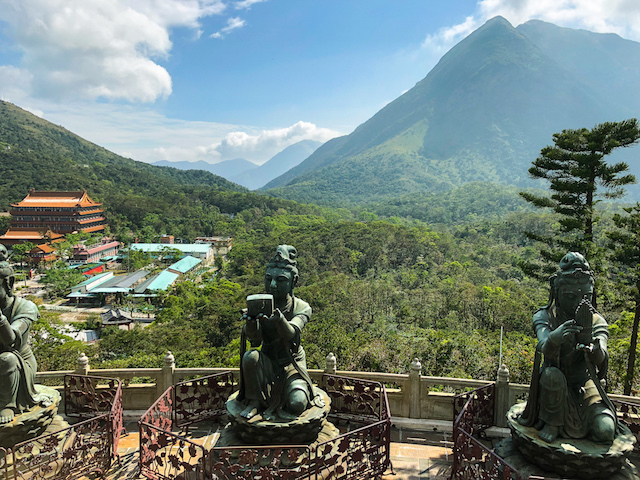 I headed over to the Tian Tan Buddha, an enormous Buddha statue with 360 views of the surrounding lush Lantau mountainside. After, I walked down and visited the Po Lin Monastery, which unlike Man Mo and Chi Lin, was an active monastery where I could witness pilgrims in prayer. I had never before seen a buddhist prayer ceremony and was honored to be able to catch a bit of the incense, singing, and solemn mood of the service. Finally, I headed over to the Wisdom Path, which is a series of wooden pillars with quotes in Chinese calligraphy from the “Heart Sutra”. I wish I could have understood what they meant (no English translation) but regardless, the pillars framed against Lantau peak made for a glorious setting. If it wasn’t such a warm day and if I was more prepared with water and food, I would have liked to hike down to the MTR along the Lantau Peak trail, which is a 6 hour round trip hike of wooden stairs carved into the mountainside. Walking upstream from the swarms of tourists, I went to the bus terminal at Ngong Ping only to realize the next bus to Tai O wasn’t for another hour. Fortunately, I found some other Americans waiting for a taxi and they agreed to split the fare with me into town. I ended up spending the rest of the afternoon with them as we explored the alleyways of the fishing village of Tai O, and took in a vista of the newly completed bridge to Macau - the longest bridge/tunnel ever made over sea - a whopping 30 miles long! I eventually said my goodbyes to my American friends and headed back into Hong Kong, this time taking a bus from Tai O (the ‘1’ - exact cash only) to the ferry terminal at Mui Wo, which had a speed ferry to Central. This turned out to be a bit of a roundabout way to get where I wanted to go, as the MTR might have been faster with less windy roads, but it was scenic if nothing else! I ended the day with more recommended food - Oddies Foodies for Hong Kong Egg Waffle, followed by Tycoon Tan for Peking Duck. I would go so far as to say my meal at Tycoon was one of the best and more memorable of my life. I don’t normally feel that way about food, but my god, was it tasty. And why not eat dessert before dinner on a last night in a foreign city? Last but not least, I visited Ozone, the bar and restaurant atop the Ritz Carleton. It’s the highest bar in the world, and quite swanky (and expensive), on the 116th floor of the hotel. Hong Kong was a whirlwind adventure, but it couldn’t have been more perfect. I enjoyed wandering and getting lost in an enormous city, hiking some mountains, beautiful vistas, enjoying endless world class, affordable food, and taking in the perplexing and unique architecture of this city. What impressed me the most was that for a crowded place, Hong Kong was orderly. The subways were clean with good signage. Though everywhere was crowded, people were not overly aggressive. In general I found Hong Kong incredibly hospitable to me as a tourist, an English speaker, and as a woman. I have traveled alone in a lot of parts of the world, and I have never felt more safe than in Hong Kong. In case this was a lot, I have created a map with labels and icons for all the places I mention in this post. Check it out and keep it handy with you (and saved offline!) if you ever travel to Hong Kong.